Nour was barely a teenager when an unexpected knock came at the door of her family’s home in Syria. On the other side were armed soldiers — there to arrest her father for reasons they never bothered to make particularly clear. After his release, Nour and her family left their home, their extended family, and the only life they’d ever known to seek refuge in United States to avoid persecution. They arrived in Salt Lake City in the winter of 2013 with the hope of building a safer, better life for themselves. And while escaping their dangerous conditions in Syria was a welcome change, the transition to their new life in Utah was difficult. Nobody in her family spoke any English, they had little to no money, and they were ill prepared for the harsh Utah weather. 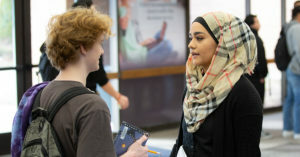 Despite those many obstacles, Nour said the many resources and services provided by United Way of Salt Lake (UWSL) and its partners — particularly the Mentor 2.0 program — allowed her to build a new life where the future is bright. 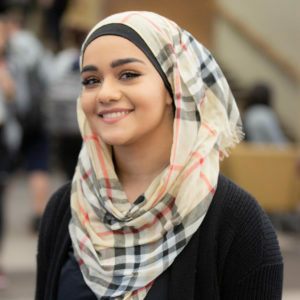 “I mean, what [United Way] does for schools and what they do for other families who come here … it’s like, oh my God, this is the type of community I would like to be in,” Nour says now. So, Nour and her family made their new home in South Salt Lake, a UWSL promise community. Such communities level the playing field so all residents are given access to opportunities to live their best lives and provide a seamlessly linked pipeline of services, partnerships, and resources related to education, health, and social needs. She was also connected to the Mentor 2.0 program — a UWSL partnership with Big Brothers Big Sisters that matches students, particularly those who will be first-generation college students, with adult mentors for the duration of their high school careers. Mentors and mentees communicate weekly via email and meet at the student’s school monthly to talk about professionalism, perseverance, self-advocacy, college financial aid, and career choices. The first meeting with her mentor was a little nerve-wracking, but their relationship quickly blossomed, as Nour’s mentor took a genuine interest in her schooling, her home life, and her fledgling debate-team career. The support was especially meaningful to Nour, as her parents were often too busy trying to provide for the family to make it to all of her events and activities. And she still maintains a close relationship with her mentor. She hopes that regardless of her career path — Nour is still deciding between psychology or pre-law — she will help others, particularly other refugees, become who they’re meant to be and shape her community for the better. If you are interested making an impact on a student’s life by becoming a mentor or tutor, please visit United Way of Salt Lake’s volunteer page here.